Are you taking a road test in a car, bus, or big truck? Learn about roundabouts and the correct way to navigate these - watch the video! Hi there smart drivers, Rick with Smart Drive Test talking to you today about roundabout and how to navigate roundabout successfully for the purposes of a road test. I had a comment from Rahim, and he wanted more information about how to navigate roundabouts. 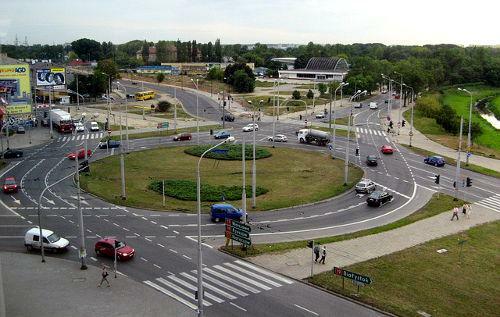 Now if you're having some challenges in North America with roundabouts... little wonder. Roundabouts have only begun to make an appearance in the driving landscape and are new. And even for veteran drivers, they're having some challenges with roundabout here in Canada and the United States as you can see here in the image with the new roundabout in Sicamous, British Columbia and the car going the wrong way on the roundabout. So you need to be prepared for that here in North America. Now those of you in the UK, in Europe, Australia, China and other parts of the world, you're probably having a bit of a chuckle about our challenge with roundabouts making an appearance in the driving landscape because they are prolific in those countries and very much part and parcel of their driving landscape. 1) first and foremost, there are fewer points of conflict for turning traffic in the roundabout. So therefore there are less traffic crashes at roundabouts. 2) And the next thing is that they facilitate a higher level of traffic flow through the intersection. So therefore you have more cars going through the intersection per hour, as opposed to a conventional intersection. 3) And finally the other benefit to roundabout is there's less noise because there are fewer cars that are actually coming to a complete stop and then accelerating away from the intersection as you have in a conventional intersections. And for somebody who lived on a very busy corner here in Vernon, British Columbia on a conventional intersection, I know all about urban noise because of traffic. And one last point that I will make here in the introduction: when I moved to Australia, there was a real learning curve when it came to roundabouts and it took me a few months to get comfortable with roundabout. Once you're comfortable with them, they're great! So what we're going to do today, we're going to give you a bit more information and some techniques to deal effectively with roundabouts. So stick around, we'll be right back with that information. Hi there smart drivers, Rick with Smart Drive Test, welcome back. I'm talking to you today about roundabouts And there are some very famous roundabouts in the world and the one you can see here is the famous clock tower in Dubai in the United Arab Emirates. You can also see here in the image one on century avenue in poo dog shanghai china which is another very famous one and unfortunately these are in time-lapse photography and they look a little bit crazy when they're fast forwarded in terms of traffic going through the roundabout. 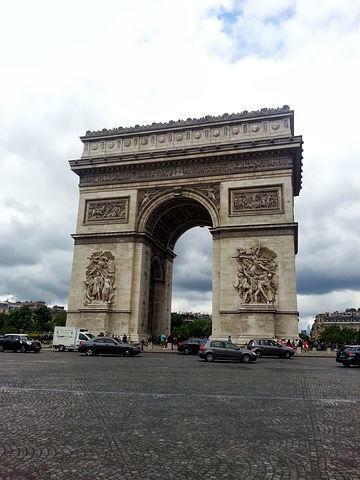 Probably one of the most famous roundabouts in the world is the one that surrounds the Arc de Triomphe in Paris, France. And you can see that this one is not well demarcated. That there aren't road markings; There aren't line markings to direct the traffic. It looks kind of like a melee and for those of us who are uninitiated in driving these roundabouts--and this other one here you can see in Italy. There are not good road markings on them. It could be a bit of a challenge for us. And then those of us in North America feeling a little bit challenged by roundabouts. It has been made a comedy by Griswold European vacation where the Griswolds get stuck in the roundabout, as you can see here in the image for a good long length of time. And continue to go around for at least eight hours and continue to say, "oh look kids, Big Ben, Parliament, Big Ben, Parliment..." [CHUCKLING]. So if you're feeling a little bit challenged by roundabouts, little doubt. But for those of us who have been initiated into roundabout, who've lived in another country where roundabout are prolific, we can hopefully give you some information, some techniques about roundabout here today. Now most of the roundabout in North America are going to be single lane. Very few of them going are going to be multi-lane because we have a reluctance to put roundabout in despite the benefits of roundabouts. And if you want to see a perfect example of roundabout being screwed up in North America, the one Victoria at the Victoria International Airport. There are five roads that meet at the junction and instead of putting in one multi-lane roundabout, engineers decided that it was a good idea to put in three roundabout and an overpass instead of one big round about. That shows you the reluctance in North America to put in roundabouts. Despite that, they're making inroads into residential areas. And many of them are single lane. Now as I said in the introduction, when you're coming up to the roundabout you've got to be prepared to stop and go at the same time. And what I mean by that, you've got to be scanning well ahead at the roundabout and determining if there's traffic in the roundabout. You have to yield to any traffic in the roundabout or traffic that's about to move into the roundabout that's going to impede your movement through the roundabout. Now other countries--Australia and the UK--are specific on a road test about signaling in the roundabout and approaching the roundabout. So the best way to think about that when you're approaching the roundabout: if you're going to turn right is to think of it like a conventional intersection. What would you do at a conventional intersection? If you're gonna turn right at conventional intersection you're going to put your right signal on and indicate that you're going to go right. If you're going to proceed straight through the intersection you're not going to put your signal on, and if you're going to turn left at the intersection, you're going to put your left signal on. Now the best way to think about this in the intersection is to think of a line cutting the circle in half. And you cut the circle in half: anything on the right side of the roundabout, you're going to signal right to either turn right or proceed straight through the intersection. As I said, you don't have to put your signal on when you proceed straight through the intersection, but when you're exiting put your right signal on to indicate two other traffic that you are in fact going to leave the roundabout. Now if you're on anything on that side of the roundabout--on the left side of the roundabout--you're going to signal left. If you're going to turn left or you're going to do a "U" turn, you're going to signal left before you enter the roundabout to indicate to other traffic that you are in fact going to turn left or do a "U" turn as you proceed through the intersection. So you're moving up, there are arrows to indicate in which direction the roundabout is flowing. For those of us on the right side of the road, it's going to be in a counterclockwise direction; for those of you on the left side of the road in the UK and Australia, it is going to be in a clockwise direction. Now just the parts of the roundabout - just s a quick overview - these are commonplace in terms of roundabout and these are called splitter islands. These simply move the traffic in the direction that flows around the roundabout. As well, almost all roundabouts in the UK and Australia, in Canada, in North America and the United States all have Yield signs. And there are a specific yield sign as you can see here in the image that have the directional arrows of which direction the traffic travels around the roundabout. 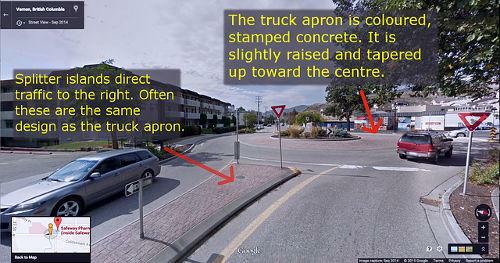 For those of us in North America, particularly here in Canada, this red part around the inside circle of the roundabout is called the truck apron. This truck apron is for larger vehicles to accommodate the off-tracking, because the rear wheels on the bigger vehicle take a shorter path from the front wheel. And therefore are going to go up over this truck apron. And it is slightly raised. It's color stamped concrete and it actually looks like paving stone, but in fact it's a slight pink color and you can see that in the image here, which shows the truck apron and this is to accommodate larger trucks, lorries, semi-trailers, large RV vehicles and buses, and those types of things. Now this is a conventional intersection here in North America. One of the other things that they have in London and the UK is they have small, sometimes called traffic circles, but they're actually really small roundabouts. And sometimes you'll just have a traffic button in the middle of the intersection. It's basically a conventional intersection where they put a dish--an upside-down dish--on the ground to make it into a and a roundabout. And those are very small and sometimes you might actually have to drive over the traffic button. And some of the other videos that you find here on YouTube about roundabouts and those types of things you're just going to have to just drive over the traffic button because you're not going to be able to get around here. So essentially, those are the parts of the roundabout. As I said, in North America, you're gonna find that they have these trucks aprons on them, and they're slightly elevated and that's to dissuade passenger vehicles from going up over there. These are just for larger vehicles and those types of things. Now signalling when you come in, if you're coming here and you're going to make a right hand turn you signal right before you get into the roundabout. Then simply yield the right-of-way to all traffic in the roundabout and any pedestrians who might be crossing at the crosswalks prior to the roundabout. And you simply--if you don't have to stop, if you don't have to give the right-of-way to any other vehicles or road users in the roundabout--you simply turn right and then look up and accelerate into the path of travel. Now if you're going straight through, you don't have to signal, but if practicable--which means if you can do it--when you get to this position, you would put your right signal on to indicate to other traffic that you are in fact going to leave the roundabout. Now if you're going to turn left as you're coming up to the roundabout, you would put your left signal on, yield to any other traffic or road users in the roundabout and then simply follow this path and exit left out of the roundabout. Now as you're moving around here you're watching other traffic and you're covering the brake. Now if you make mistakes when you first go into the roundabout, when you're first learning how to do it keep in mind that other traffic in the roundabout is doing the same thing that they're that you're doing. They're also scanning for other traffic and they're going to give way. You can see here in this instance that the guy backed up in front of me today in a roundabout. There's a house right on this one edge of the roundabout and the driver backed out into the roundabout. So I had to slow down and stop. So other traffic is also watching and looking as you're moving through the roundabout. So if you make a mistake it's not going to be terminal in most cases. And the other reason that we have roundabouts and that round about the beginning to make appearances on our driving landscape is because there are less points of conflict in the roundabout. And it's less likely that you're going to have a crash. Now the last thing that you may do in a roundabout and the very handy for this is, if you lose your way and you need to go back and do a U-turn, do the same thing as what you're doing with a left hand turn. Put your left hand signal on and when you get to this point in the roundabout, you're going to change your signal and put your right hand signal on to indicate to the other traffic that you are going to exit the roundabout. So that's how you proceed and do a U-turn through the intersection. So it's simply in this path of travel and at this juncture put your right hand signal and then exit the roundabout. So that's how you do it and again when you're proceeding through the roundabout, as you're coming up to the roundabout slow to 20 kilometers an hour, or 12 miles an hour for those of you in the United States. If you're driving a manual transmission, have it into second gear, cover the brake and be prepared to stop as you're approaching the roundabout. And again looking far down the road locating the roundabout and looking for vehicles approaching in from the left, if you're on the right side of the road. If you're on the other side of the road, you're looking for cars coming from the right that are going to impede you moving into the roundabout. And as well, you're going to have to be looking at the other vehicles that are approaching the roundabout so that you can smoothly enter into the roundabout because the purpose of the roundabout is so you don't have to stop. But if there are other vehicles that are going to impede your progress into the roundabout, you're going to have to stop. The next thing we're talking about, we're going talk about multi-lane roundabouts just briefly here. 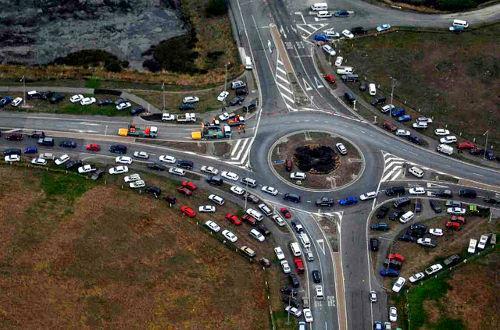 If you have a multi-lane roundabout, which is unlikely in North America, more likely in Europe and Australia. Essentially you need, again, think of it like a conventional intersection. If you're going to make a left-hand turn you want to be in the left hand lane. If you want to make a right-hand turn, you want to be in the right hand lane as you're approaching the roundabout. And again, if you're in the right-hand lane, you're simply going to make a right turn are going to proceed straight through. Again with a multi-lane intersection--conventional intersection--same thing. If you have a multi-lane roundabout and you want to proceed straight through, you can also be in the left lane to proceed straight through but if you're going to make a left-hand turn you want to move over to the left hand lane and then proceed in the left hand lane and stay in that left hand lane as you proceed through the roundabout. Come around here and stay in that left-hand lane. You want to avoid at all possibility changing lanes in the roundabout because there're just too many things going on in the roundabout to be changing lanes. As well, think of it like changing lanes in a conventional intersection... it's just too dangerous. So most of the rules that apply to conventional intersections also apply to roundabouts. And if it's a multi-lane roundabouts you want to be in the lane of the direction you're going to turn. So if it's two lanes, you want to be in the far left lane to turn left or to do a U-turn. If you're going to turn right, you want to be in the right hand lane to turn right or proceed straight through. You can also be in that left lane. Now if you're driving a larger vehicle--a large RV, a bus, or truck--you want to be in the outside lane to go around the roundabout. That way you're going to compensate for the off-tracking as you're moving through the roundabout. And that's multi-lane roundabouts. Now as I said in North America it is unlikely you're going to encounter multi-lane roundabouts. More likely that you're going to encounter multi-lane roundabouts in Europe, Australia and other places - China and the Middle East and whatnot. But for the most part these are rare and essentially just stay in your lane and think of it like a conventional intersection. So what we're going to now, we're going to the car and we're going to drive to some roundabout and do some right turns and left turns and some U-turns and show you how to do that. We're approaching the roundabout here and we can see the sign on the right that says 20 kilometers an hour and it indicates which direction that you travel here on this roundabout and it is counterclockwise. And if you're driving a manual transmission it's recommended that you go into second gear. We're looking to the left, and we don't see anybody and we're proceeding straight through the roundabout. And leave it in second gear, and we look up and accelerate in the direction that we want to go. So we're going to turn left at the intersection here, counterclockwise direction is recommended and 20 kilometers an hour. Signal to the left, put the vehicle into second gear, which brings us down to approximately 20 kilometers an hour. The roundabout is clear, steering all the way through, watching the other roadways that merge, and proceeding through and accelerating. And we're gonna go left at the next roundabout as well. Left signal on as I'm entering the roundabout. Signalling left and immediately before exiting I signal right telling other traffic that I'm exiting the roundabout. We're going to proceed right at the roundabout. Mirror, signal, shoulder check. The direction of the roundabout is counterclockwise. We yield to other traffic. Nobody in the pedestrian crosswalk. We have a vehicle coming in and he has momentum. We did not have a momentum because we're going uphill and I was slowing down because I was scanning the pedestrian crosswalk. We stopped and now we wait for the gap to go. Shoulder checking and we don't have time to signal - we've already signaled right prior to the roundabout, so we just simply turn right at the roundabout. And we're going left at the roundabout and I indicate left as I'm approaching the roundabout. Nobody in the crosswalk or the zebra crossing as they call it in the UK. Shift into second gear. I'm scanning, there's nobody coming. We're good that way, good at this intersection. And immediately, just before we signal to the right, and exit the roundabout. We're going to turn left at the roundabout. We signal left as we're approaching. Nobody in the pedestrian crosswalk. Good at the junction. Nobody coming from the other direction. We're good. And just before we exit the roundabout, put on our right signal and exit. And no pedestrians. We've located the roundabout in front of us and we looked up at the roundabout and we discovered that it's 20 kilometers an hour. And it is counterclockwise and we're gonna do a U-turn here. Nobody in the roundabout, the junctions are good. There's no one coming. There's a vehicle coming from that direction. And they're slowing and we turn our right signal on to go on and proceed. Alright, so we're gonna turn left. We've located the roundabout. It is a counterclockwise direction. We're coming up, nobody in the pedestrian crosswalk. Actually there is someone in the pedestrian crosswalk and we need to stop. We proceed after the pedestrian has obtained the curb, and I'll put a card up in the corner for you about how far you have to be from pedestrians. Left signal, checking the junctions. No one coming. We put our right signal on indicating we're going to exit. And we exit the roundabout. We've located the roundabout and we're going to turn right at the roundabout. We can see that it's 20 kilometers an hour or less. Counterclockwise direction. You have the signs that indicate the roundabout and we have to yield to traffic in the roundabout. And we're scanning to the left here. We have our right signal on, shoulder check, scanning the other traffic and we proceed out of the roundabout. Quick review of roundabout. Yes, in North America and the United States and Canada roundabouts are beginning to make an appearance in the driving landscape. But we as drivers even better drivers are not accustomed to roundabouts because we did not grow up with roundabout as people in Europe and people in Australia and other countries have. They've grown up driving around in motorcars and encountered roundabout their whole lives. And if you look at some of the roundabouts in the world driving videos--put a link down here in the description for you-- Europe especially, and the UK take roundabout to a whole new level. Now if you're operating through roundabout here in North America think of them like a conventional intersection. If you're going to turn right or you're going to proceed straight through stay in the right lane put your right signal on. Now if you're going to turn or make a U-turn, you're going to put your left single on as you're approaching the roundabout to indicate to the other traffic that you're gonna move left or you're going to do a U-turn. Now if you're exiting the roundabout, if practicable, if you can do it, put your right signal on to indicate to the other traffic that you are exiting out of the roundabout. Now when you're coming up to the roundabout, obey the speed signs. Most of the time in Canada it is 20 kilometers an hour, In the United States it is going to be 10 miles an hour - 10 to 15 miles an hour. Slow to that speed if you're driving an automatic and cover the brake as you're coming up to the roundabout. Looks as far down the road and identify the vehicles and road users that are in the roundabout, and be prepared to stop by covering the brake. If you don't have to stop, proceed through the intersection. Most roundabouts will have a give-way sign, which means that you have to yield or give the right- of-way to traffic in the roundabout or other road users. Now most of the roundabouts in Canada and the United States have pedestrian crosswalks preceding them, so ensure that you're looking for pedestrians and those types of things. In the UK, they call them zebra crossings. So if you ever heard that term before--zebra crossing--it is essentially a pedestrian crosswalk prior to the roundabout. Now one point that I didn't cover in the topic is emergency vehicles. If you're in the roundabout and you hear an emergency vehicle or see an emergency vehicle approaching the roundabout, you may have to exit and then pull over to the side of the road. Don't pull over in the roundabout. There's just too much going on there in terms of emergency vehicles. So the easiest way to think about roundabouts is think of them like conventional intersections. What would you do at a convention intersection? If you turn right or are proceeding straight put your right signal on if you're turning right. You don't have to signal left if you're proceeding straight through. If you're turning left or a U-turn, simply put your left signal on. And again for those drivers practicing for the purposes of a road test and you have roundabout in around the licensing center, go out and practice going through those roundabout so that you're familiar with them. Because there is a learning transition. It is very different because there's a spatial orientation that's going on, and the left side of the brain is responsible for that. And you have to determine speed and space of other road users and traffic in the roundabout as you're approaching the roundabout. And you have to find a gap for you to proceed through because ideally you don't want to stop. Now as I said in the prologue of this video, if you are moving into the roundabout and you miscalculate the gap it's unlikely that you're going to experience a crash. And if you do experience a crash, it's going to be a minor crash because there are less points of conflict in a roundabout. And other drivers are doing the same thing that you're doing as you're coming into the roundabout. They're scanning, they've got the brake covered and are prepared to stop. And they're watching other vehicles in the roundabout because when you get a little bit of experience with roundabouts you know that you're always looking for the traffic, you're making sure that other traffic is coming to a stop as you're proceeding through the roundabout, especially if you're making a left-hand turn and going past the other roadways that intersect with the roundabout. And making sure that the traffic is in fact coming to a stop. So it's less likely that you're going to experience a crash in a roundabout if you misjudge the gap are coming up to it. So that may give you a bit of comfort for those of you learning how to navigate roundabouts - knowing that there are fewer points of conflict and that all of the other drivers are sort of aware and more aware, particularly in North America. They're trying to look out for the traffic to make sure it actually stopped. So take comfort in that and knowing that there are fewer points of conflict and other drivers probably looking out as well. Do you have any tips for new drivers learning how to navigate roundabout and things that they should do in order to learn how to do that successfully and do that for the purposes of a road test? 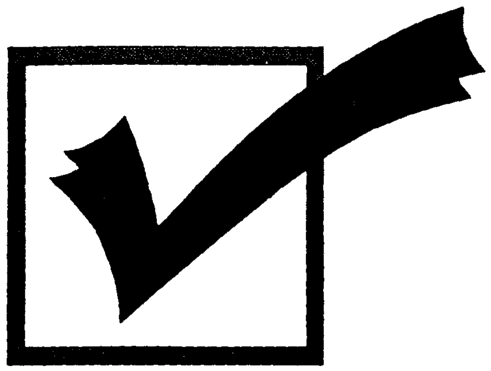 Leave a comment down in the comment section there - all that helps out the new drivers working towards getting their license. I'm Rick with Smart Drive Test. Thanks for watching. If you like what you see here share, subscribe, leave a comment down in the comment section. As well, hit that thumbs up button. Check out all the video here on the channel if you're working towards getting a license or starting your career as a truck or bus driver. Great information here. As well, head over to the Smart Drive Test website - great information over there and online courses that you can purchase. All the courses are guaranteed, 30-day money back guaranteed. Stick around to the end of the video, funny bits and links to the other videos and to my website. Thanks again for watching. Good luck in your road test. And remember pick the best answer not necessarily the right answer. Have a great day. Bye now. [DAUGHTER] Dad's teaching about roundabouts. [SON] How do you teach about roundabouts? [DAD CHUCKLING] [DAUGHTER] Are you teaching about roundabouts? [Dad] I am, yes. Are you done Dad? Are we done?